I haven't sent a letter to the North Pole on my own behalf for many years. I try not to ask for too many things for myself, and I don't really like having too much "stuff". Like most moms, I focus most often on the needs and wants of my family with minimal attention to myself. But for once, I'm going to be selfish, and prepare a list of some of the things that I really want for Christmas. I'd like to not look and feel so old, tired, dishevelled and frumpy. To accomplish this, I suppose I'd need some sort of makeover: hair cut and colour to do something about all those grey hairs that keep appearing on my head; a facial treatment of some kind to reduce the wrinkles that have found their way onto my face; and maybe a new wardrobe to make me look and feel like a 'celebrity mom'. I'd also like some willpower. Maybe with some of this magical strength, I'd be able to stop eating all the chocolate and junk which is cumulatively adding on pound after pound year after year. Oh, and some self-discipline so I could commit to an exercise program to make me fit and trim. This would also help with the frumpiness. I still can't really justify spending money on a cleaning service. It seems like a waste of money to pay someone else to do something that I'm perfectly capable of doing myself, if only I had the time. But since there are never enough hours in the day, it might be time to admit that I can't remember the last time I dusted, there are stains on our carpets that our older than our youngest child, and my oven has needed to be cleaned since Father's Day 2011. So, if I'm really well behaved between now and December 24th, could I please borrow some of your elves during the off season for a regular house cleaning routine? More hours in the day would also be a great Christmas gift. Or the ability to function, without being grumpy, irritable and too easily frustrated by young children, on much less sleep. You are magical, aren't you Santa? I know you're busy, Santa. But if you could help me out somehow, in some way, I'll promise not to break any more rules next year. I wrote this spoof of an annual Christmas letter last year, after receiving one too many Christmas letters from distant relatives summarising the perfect events of their perfect lives with their perfect families. I didn't send it. Obviously. Well, another year has flown by, and it’s time to reconnect and share our news with you all. And since I’m really too busy to write personalised notes to those of you who I don’t contact regularly, everyone, even those really close friends and family who probably already know all my news, are going to receive this standard letter with my electronic signature on festive paper, that I hurriedly wrote at work while the boss was in a meeting. The year started off with a bang, literally, when our oldest, Rebecca, crashed into a tree while learning to ski on our family trip. Although she suffered a concussion, she had no broken bones and was a real trooper. So far, no long lasting effects of brain injury are evident. After Hannah’s first birthday in February, it was time for me to return to work. I was actually looking forward to escaping the chaos of a house full of 3 girls under the age of five with their daily whining and arguments over whose princess toy was whose. I figured that work would be somewhat of a vacation since it is easy to get away with looking busy at the office while not really doing anything productive at all. Being a working mom again is difficult, although I revel in the challenge of balancing my professional, intellectual self with being a caring mother, cook, house-cleaner and laundress. I deal with the stress mostly by eating a lot of sweets and baked goods, knocking back a couple of glasses of wine each night, and lazing away the evenings in front of the television. My face may be getting more wrinkly, my hair more grey and my figure more rotund, but Greg says he still loves me, as long as I’m happy. While we would have loved to have the girls return to the day care centre in the neighbourhood school, the spots were full. The cost would have been prohibitive anyway, so we ended up with the most reasonably-priced nanny we could find. The girls really like her, probably because she lets them get away with nearly anything, doesn’t make them tidy up (she doesn’t do it either), feeds them lots of McDonald’s and sweets, and lets them sit around and watch soap operas with her all afternoon. Greg is as busy as ever at his job. He took on a new management role in May with a large team of mostly young women. While he often has to work late, and has even taken a couple of overnight business trips, he loves coming home to the family and tries not to be too grumpy with us. The women he works with are very nice, often staying late at the office with him to give him massages and help him relax. He is keeping in excellent shape; he frequently goes out running and plays in a football league every single weekend too. Hannah has grown so much over the past year. Now 22 months old, she is just about ready to potty-train. She is also sleeping in her own toddler bed for at least a couple hours of the night. She also really loves waking us up several times a night, just to be tucked back in her blankets again. Hannah is saying many words, and even some partial sentences, such as “Hannah awake, back bed, please”. Rebecca and Leah have both been enjoying lots of recreational activities: swimming, ballet, gymnastics, and trampoline. While Rebecca seems to excel in ballet, Leah loves gymnastics and trampoline. That she continues to fall off the balance beam and trampoline will not deter her. Hopefully by the time she is 4 next year, she will be better coordinated and less bruised. Unfortunately, her instructors have told us that it looks like she will be too chubby and uncoordinated to ever pursue gymnastics at more than a recreational level. Rebecca started Senior Kindergarten in September. She really enjoys sitting alone at the craft table, and doesn’t seem to mind that the other kids laugh at her when she talks about the stars she sees in her head and the bumblebees humming in her ears. The teacher says that Rebecca is a pleasure to have in class and not to worry, eventually she’ll learn to focus her attention and figure out the sounds that the letters make. It seems that I’ll have more time on my hands come the New Year as I was just let go from my job. Apparently, using company resources and time for personal use is frowned upon, even if you don’t think anyone has noticed. 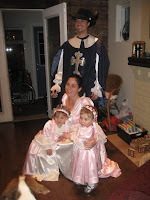 Well, that wraps up the highlights of 2011 for the Hargrove family. I wish everyone a joyous holiday season and all the best for the New Year. And while I hope that we might do a better job of keeping in touch in 2012, I know that the next time I will probably even think of most of you is when I print off your address labels for next year’s letter. Over the past few years, I have developed a strategy for writing and sending Christmas cards. It's a carefully devised plan to make efficient use of time by streamlining who gets a card, who gets a photo and who gets a personalised note, and who gets a more elaborate letter. Make sure I have an ample supply of cards left over from at least two Christmases ago so I can avoid sending the same card to somebody two years in a row. Arrange to have one of our family or at least children pictures developed into small, wallet-sized photos. I personally never really know what to do with the photos of my friends' children, so I figure, as long as the photo is small, people can feel less guilty about tossing it or "accidentally" recycling it. And if they do decide to keep it, at least it doesn't take up too much room. Begin working alphabetically through my old-fashioned address book that I've had since high school. If I don't have a mailing address or I won't be seeing someone in person, they won't be getting a card. Try to be sensitive about the nature of the greeting and image on the card so that I avoid sending "Merry Christmas" to friends who are Jewish, or overtly religious cards to those who are agnostic. Cards will not be written for those I haven't seen or heard from in a personal way in the past three years. Facebook-only friends with no other personal interaction do not routinely qualify for a Christmas card. If I have regular, personal (email communication included) interaction with someone, they will get a card and a photo (unless it is a business relationship), with a personalised greeting. 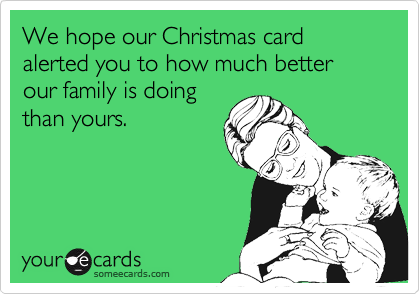 Extended family, even - maybe especially - if I don't see them very often, will always get a card and a family photo. But if I feel that they receive regular updates on my life from my parents or siblings, I may omit the personal note. Good friends will receive a card and photo and a personal note, unless I will be seeing them over the holidays, in which case the personal note may be omitted. For friends on Facebook, whom I assume are relatively current on my life from somewhat regular status updates and photos, the personal note may be omitted. For special relatives and old friends, with whom I only really keep in touch at Christmas, the personalised note may become a more detailed summary of my year. The personal note, is exactly that - personal. I do not write "Christmas letters". It is because I short- list the cards which include more detailed notes and letters that I am able to keep my cards personal. Have Christmas cards sent by December 20th. If I can't meet this deadline, chances are I won't send them at all. Like last year. Although I think it's a great idea, I'm not sure how many others would appreciate a New Year's card. 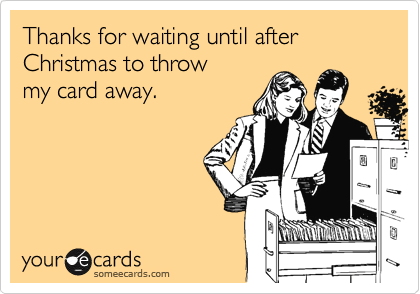 And besides, if we're being honest, any motivation for writing cards has pretty much disappeared after the 25th. This year, I didn't get started on my cards until this weekend. But fortunately, by sticking to my strategy, I plan to have them all in the mail by tomorrow night! I've found another terrific parenting/cookbook! Dinner: A Love Story, evolved from a website, written by former magazine food writer and editor, and mom of two, Jenny Rosenstrach, and it is a pure pleasure to read. Although it is filled with simple, healthy, quick family dinner recipes, what I really love about this book is that it's not so much a cookbook, but a working mom's memoir about her commitment to preparing healthy meals and have dinner together as a family. I knew right away that I could relate to Jenny Rosenstrach when she wrote about her meal log - her 'dinner diary'. She has faithfully recorded every dinner cooked and/or eaten since 1998! A little obsessive, perhaps, but definitely organised. As many working moms have learned, she further proves that being organised about meal planning is very helpful in conserving whatever shred of sanity that we can save. Her story begins in the pre-children phase, when she and her husband began establishing their "rituals, relationships, and repertoires". Learning recipes; supplying the cupboards, shelves and drawers with the essential tools and cookbooks; gaining appreciation for quality ingredients; hosting easy and inexpensive dinner parties, and all-in-all, getting comfortable in the kitchen and laying the ground work for the soon-to-be family love affair with dinner. Reading this chapter also made me recall how proud I felt on those days when we successfully prepared a decent meal and had all the clean up done before I collapsed into bed. It was always such an accomplishment. I have no real recollection of the meals that we ate. Alas, I didn't keep a dinner diary. I chuckled out loud reading about her 'onion trick'. My mom always used to say the same thing... as soon as you start sauteing an onion, the kitchen smells like something good is cooking. From this section, I tried the apricot-mustard baked chicken, chicken with bacon-y brussel sprouts, spinach tomato and feta frittata, and fish presents. All delicious and well-received! As her children grew from being toddlers to little kids, the author promises that there is a light at the end of the tunnel - the milestone of preparing and sitting down to family dinners without too much stress, fuss or fighting is upon us. That glorious moment when you realise that your children are playing happily and you can sneak away to start preparing dinner. I am coming to really appreciate the kids programming on TV after we get home from school so that I can have a few moments of relative peace to pour myself a glass of wine and start cooking. With wine in hand is how I found myself preparing the recipes for royal salmon with yogurt-mustard dill sauce, and mustardy pork chops with apples and onions. Since dinner preparation is usually only begins at about 5:45 at our house, the primary criteria for recipe selection is preparation time. Besides being made from fresh ingredients, it's important to point out that most of the recipes in this book take less than 40 minutes to prepare. And most importantly - the preparation time written for the recipe is accurate! Including vegetable chopping-, and trip-upstairs-to-help-the-2-year-old-wipe-her-bum-and-wash-hands time! Whether fictitious or not, I laughed at the correspondence between husband and wife about barbecuing fears and responsibilities; I too, am not only fearful of the using grill itself, but afraid of stepping into my husband's territory! I also loved Jenny's parenting philosophies and her interpretation of creating habits and routines as an example of laziness. But in a good way. When rituals are in place for getting ready for school, dinnertime, bedtime, etc., we as parents don't need to think too much. We can resort to autopilot, which is kind of what we need at the end of a long day. I don't read a lot of cookbooks, so I don't know whether her approach is unique or not. But I certainly enjoyed the way that the recipes were interspersed with little explanations and personal stories of their relevance in her life. It was the personal anecdotes of familiar situtations which made the book so enjoyable, and also encouraged me to believe that creating healthy family meals with young children is possible. Definitely not easy, but certainly doable. Now you can see why I've been so reluctant to return Dinner: A Love Story to the library. It's due back on Friday. I promise to return it so someone else can enjoy it as much as me. We’ve all been there. Participating in meetings which seem to go on forever or which don’t really seem to apply to us personally. Feeling like our voices aren’t being heard. Getting really upset by someone’s contrary opinion. Squirming with the rising tension. Sometimes I get frustrated. But I rarely get mad. And I never yell. But sometimes my mind wanders. No patience. Usually there is an agenda for a meeting. Yet so often, people display that childlike quality of “I want it now” and jump to talking right away about an issue that is most important to them even though it is scheduled to be addressed later on in the agenda. No focus. I often get frustrated with my 6- and 4-year old daughters for not paying attention when I’m talking to them or asking them to do something. It drives me crazy. It also drives me crazy when people in meetings ask questions or repeat comments that have literally just been addressed. Going way off topic. When we ask our 2-year old about her day, it starts out all normal talking about story time at daycare and how some kid (often her sister) told her she didn’t want to be her friend anymore. But before you know it, she’s making up stuff about eating bugs for lunch or trying to describe some minute detail about the little thing she found on the playground but then lost and worrying that somebody stole it. It’s kind of adorable. The grown-up version of this happens in meetings all the time. It’s not so adorable. But equally hard to follow. And more frustrating since other people have things to say too and timelines to keep. Being self-absorbed. You know how kids can go on-and-on-and-on about some topic or another that you really don’t understand or even care too much about. It’s kind of cute and endearing, but not really a waste of my time. However, when someone presented something in a meeting carries on-and-on-and-on, rehashing a topic over-and-over again, going into way too many details or specifics, under a delusion that people are really interested in what it is they are saying, I feel my time wasting away. It drives me crazy. Over-reacting. We all tend to lose perspective from time to time. My kids are terrific at getting overly dramatic about tiny little things that really aren’t that important; especially since 5 minutes later they’ve probably forgotten about it and moved onto something different all together. It drives me crazy when people do this in meetings though. Make a HUGE deal out of things that either aren’t really that important and/or not totally relevant to what’s being discussed. There is a time and a place. And a thing called perspective. Falling subject to distractions. We all have a tendency to zone-out after a while when we aren’t completely captivated. Children would just get up and leave. Or, more likely, start acting out for attention. I guess grown-ups kind of do this too: start hushed chit-chat (which isn’t really that quiet), doodling, reading emails, or sending ‘very important’ texts. Or anticipating lunch. Falling asleep. Because, really, we could all use more sleep. And sometimes, meetings are really boring! Tantrums. I’ve heard it called the noodle. My sister calls it the stages of despair. But wouldn’t it be a great release if you could just flop and scream and kick when you didn’t get your way. When no one agreed to your idea. Wouldn’t that take them by surprise! Would they listen then? Getting up and walking away. Seriously. How great would it be if you could just stomp out, or ‘take your ball and go home’ when no one is listening to you or your concerns, or playing by your own rules! I hadn’t included name-calling and shouting in my lists, but apparently some grown-ups, politicians no less, feel this is an acceptable way to behave in meetings. I'd be giving them a time out. 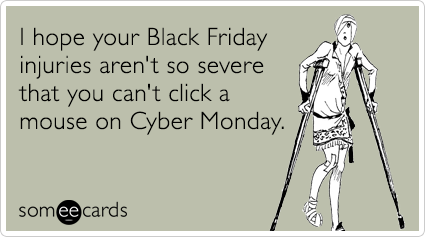 I'd heard a lot about Black Friday. I even experienced it one year in Boston. Although all I can recall is a hazy memory of a crowded mall and G.I. Joe action figures. I don't think we bought anything else. 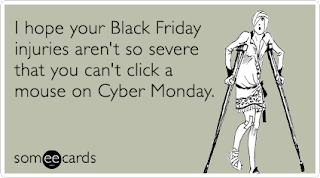 This was the first year I really became aware of Canadian retailers marketing Black Friday so strongly. The first time that such strong efforts were made by Canadian stores to keep Canadians in Canada with super specials and bargain buys on the last Friday of November. It wasn't our intention to go Black Friday shopping, but since my husband and I both had the day off and we had some things to buy (dress pants for him, black shoes for me) we ended up at the mall. Sure, there were good deals. And we got what we were looking for. But I couldn't help feeling terribly overwhelmed. Overwhelmed by the sheer quantity of things to buy. By the volume of stuff that was somehow suggested we needed. By the rows and rows of cars in the parking lot. By the number of people in the mall. By the amount of money being spent. By the thought that we had just spent money that we don't really have. 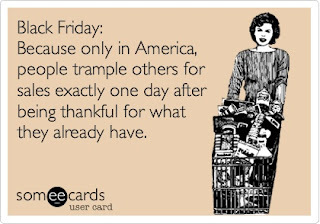 That's probably what I thought about the most: all of us spending lots of money, probably mostly on credit, on lots of stuff that we don't really need. I also thought about all of our money going to big stores and major corporations instead of the little shops in our neighbourhood owned by people just like us, trying to make a living. I'm hoping that it was my last trip to a mall during this holiday season. I'm going to try to do my holiday shopping in the local businesses and small stores downtown. Then, I read about Giving Tuesday, and I started to feel better. A day to give back to your community. A day to donate to charity. A day to compensate for all of the greed and consumption of commercial goods that can all too easily take over the holiday season. Charities could market Giving Tuesday as the day to purchase 'gifts' for those on your list who are hard-to-buy-for. How about hens and a rooster, or mosquito nets for families in Africa on behalf of your great-aunt who has everything? Or organizations could plug Giving Tuesday as a day to secure pledges from individuals to commit to volunteer efforts over the holidays or in the New Year. Wouldn't it be great if Giving Tuesday would catch on? A movement to encourage us to rethink how much money we spend on 'stuff' for family, friends and ourselves. On people who already have so much. A campaign to encourage us to donate as much to deserving charities that help those in the world that truly know the difference between 'want' and 'need'. There's still time left, what are you doing for Giving Tuesday today? We continue to battle the germs in this house. I knew conquering cold and flu season wouldn't be easy, but it's only November, and it has already taken its toll on me. I think the fact that there are three little kids in this family exponentially increases the number of germs we are exposed to, and hence, the frequency of illness. It probably also compounds my guilt. I hate seeing my little ones feeling miserable. But empathy is not the only emotion I feel when they're sick. I also feel guilt. Lots of guilt. ... Guilt for sending them when they should be staying home. ... Guilt that I'm taking a 'work-from-home' day when they don't seem that sick. ... Guilt that I kept the older one home from school 'cuz she's easier to look after, but sent the little one even when she's coughing as much as the older one. ... Guilt that I should've taken them to the doctor earlier. ... Guilt that I'm taking them to the doctor unnecessarily and using up valuable healthcare time and money. I realise that I should mostly trust my gut instinct when deciding when my kids should be staying home, or when they should be seeing a doctor. But my gut isn't very decisive. Some things are obvious, like the daycare 24-hour fever-free policy or not sending a kid who is vomiting and has diarrhea. But it's the less obvious symptoms that always have me second guessing myself. So, while at home today with my youngest who has a chest and ear infection, I've done some research on child care health policies, public health websites and other sources of information on the Internet. And, I've come up with the following guidelines to (at least sort-of) follow when trying to determine whether my children should be going to school or daycare, or whether I need to figure out who and how we can stay at home. Again. They've had a fever within the last 24 hours. They don't seem to feel well enough to participate in the activities there. They have a persistent, phlegmy cough and are cranky or lethargic or wheezy. They've vomited more than once within the last 24 hours. They have had more than three bouts of diarrhea in the last 24 hours. They have a reportable disease or an infectious illness such as impetigo, conjunctivitis, or strep throat. They have a cold (i.e. sore throat, runny nose, cough), but no fever, and feel well enough to participate. They have an ear infection. They have a stomachache with no other symptoms. They've had a fever for more than 3 days. They have a really high fever (e.g. more than 104 degrees). They have a cough that is getting worse or not improving after a week. They're vomiting blood or there is blood or mucous in their stool. They have a stomachache along with vomiting, diarrhea, fever and lethargy. There. Now that I've compiled some rules and checklists, I feel better. Hopefully, the little girl will feel better soon too. This is an EVICTION NOTICE. You are no longer welcome in our home. I understand that you are only trying to survive by moving from child to child, jumping from hand to nose to mouth. I appreciate that you didn't come specifically for us, that we are just a convenient vector for your life. I know that you aren't attacking us personally and that many of your friends and relatives are visiting our friends and relatives too. But enough is enough. I don't want you around anymore. I can't take any more of the fevers and the coughing and the nose wiping and the whines of "my ear is sore" from my children. I'm tired of stressing over whether my children are well-enough or too-sick to go to school and daycare. Of anticipating a phone call from the daycare informing me that my child has a fever. Of feeling guilty about wanting them to be healthy enough to go, only so I don't have to figure out who's going to stay at home with them this time. Of wondering if they really should be going to see the doctor or not. So last night, after waking up with one of my children for the too many-th night in a row due to a fever or cough or stuffed up nose, when I was trying to settle back to sleep, but realized that now I was feeling all achy and congested, I decided that your little virus party is over. You are being evicted from our home. getting our flu shots, and implementing and enforcing strict hand-washing-no-face-touching-or-nose-picking rules in our house. I know that you won't leave without a fight. But I'm not backing down. I don't want any more 'sick' in my house. 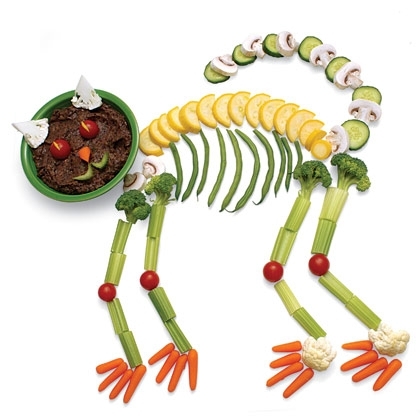 How can we have a Healthier Halloween ? When it comes to Halloween, I’m pretty sure what it is that kids enjoy most. 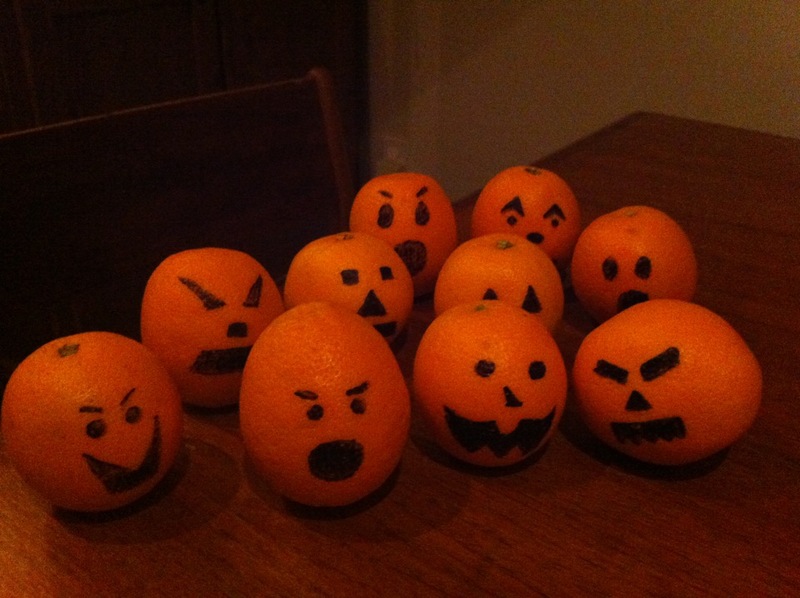 When I asked my kids “What’s your favourite thing about Halloween?”, they confirmed my suspicions. “Candy!” was their enthusiastic response. We all know that the power of candy at Halloween is pretty strong. 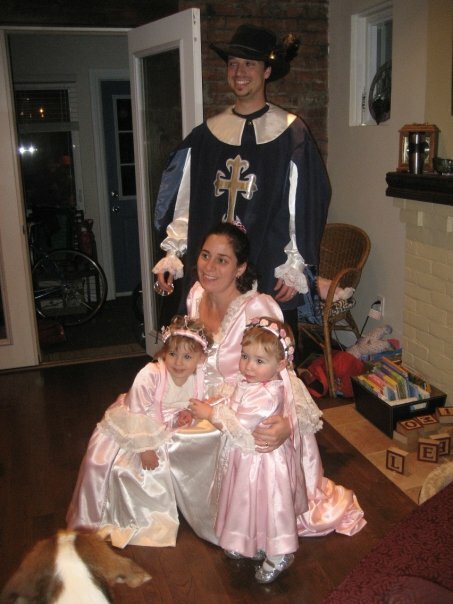 Case in point: the Halloween when I was 7 months pregnant and my middle daughter was about 18-months-old, she was initially pretty terrified about trick-or-treating. In fact, I seem to remember that she didn’t want to go out at all. But we got her dressed up and out went, her 3-year-old sister leading the way. At first, our toddler was very timid about going up the stairs to our neighbours’ houses, and would only go if I was carrying her. But if I recall correctly, it only took two houses and two handfuls of candy to encourage her to do all the other houses of our route on her own! The whole concept of Halloween seems a little off to me. I know that it’s lots of fun, but it also seems so greedy and gluttonous. I must have bothered me, at least subconsciously, even when I was a child: I actually remember having dream one year in early November in which all the kids were required to go back to all the houses they had visited on Halloween and give back the treats they received! And ironically, no one really seems to want all that candy anyway. Well, except the kids, of course, but then the parents don’t want them to have it. So everyone buys oodles of candy to dole out to the trick-or-treaters, and then tries to pawn it off on all the kids and families that come to their door so that they won’t have any left. Then the parents go through the trick-or-treat stash that’s been collected and try to get rid of as much as they can to the late-night kids who come to the door, or take it in to the office the next day. And I confess to immediately throwing out all the toffee, gummy candy and gum. Which leads me to ask: why do we bother? And as I try to stress healthy eating to my family, and limit their exposure to sugars and treats, Halloween becomes very tricky indeed. Fortunately, my daughter’s school teacher is on board. 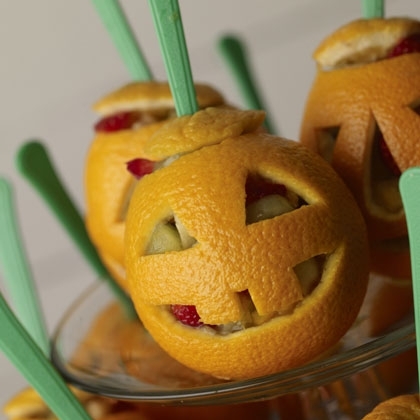 Along with the information about the Halloween class party came the request for healthy treats. While this might require a little more resourcefulness or imagination than sending traditional cookies or cupcakes, I give kudos to the school for putting nutrition ahead of sugar. I really like the crudités shaped into a skeleton or cat or witch, but since I won’t there to set it up in her classroom for the party, I can’t see how I can make it work. 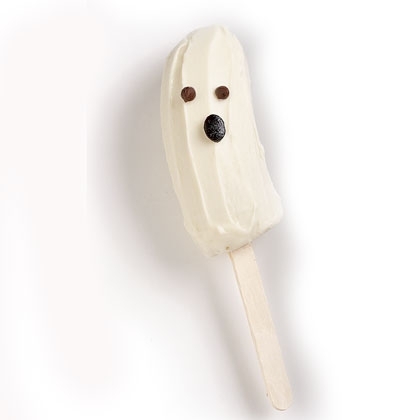 I also think the frozen banana ghost pops are a great idea, although I’ve read somewhere else about coating them with yogurt instead of chocolate to make them even healthier. But again, I’m not sure how we can manage the frozen treats at a school party. The jack-o-lantern oranges filled with fruit salad look fantastic too, but I’m a keep-it-simple kind of mom, so we opted for tangerine pumpkin faces drawn on with marker. Plus, my daughter was able to help with this one. And what about the hand-out for the trick-or-treaters? Having recently read that eating 9 mini chocolate bars equals 875 calories(! ), I knew I had to stay away from candy I liked. But I also decided that somehow, I would avoid contributing to the I saw some great ideas for Halloween Candy Alternatives from Canadian Family, and since my daughter is currently obsessed with stickers, sticker books and sticker trading, stickers seemed an obvious choice. My husband insisted that we also need to give out some sort of food treat. I decided on potato chips. Maybe because I don’t like them too much, I figure that they won’t be consumed 4 to 5 at a time, like chocolate bars. And at least they’re not chockfull of corn syrup and sugar. I just hope we don’t get egged. How do you feel about the sugar grab and rush of Halloween? Are you making any changes to make it a little healthier for your kids? Do you ever wish that some kind of monumental event would happen in your life? Something that would knock you sideways and force you to change the way you live. Something that requires you to reassess your priorities and really do something about them. Something that might change your life. In an email from the CEO first thing this morning, it was announced that the company would be reducing and reorganising the workforce, and that each and every department would be affected in some way by these changes. I got that sickening feeling in the pit of my stomach. Dread. Worry. Anxiety. I started to worry about how much I contribute at work. How valuable I am to the company. How often I cram in my work and dash off to care for my kids. I thought about all my colleagues in my department and in the organisation as a whole. Who would be let go? Who's role is redundant? Who isn't pulling their weight? Could I be one of them? With each ding of email notification, my stomach dropped a little lower. I couldn't decide if it was a good or not-so-good thing to be working from home today. Working from home to care for my sick daughter. Away from all the sadness and tension at the office, but also disconnected from it. And what if I was on the list? Would I get a call at home? Would they wait until tomorrow? As I went out to walk the dog, I thought about it a lot. What would I do if I lost my job? I wouldn't be a working mom any more. I wouldn't feel so rushed all the time. Rushing to get to work, to get my work done, to get errands done and groceries bought, to pick up the kids, to make dinner. I wouldn't be subjected to the terrible commute by car each day. I would be able to pursue other goals, ideas, dreams. I would be able to get some exercise and take care of myself. So, maybe losing my job wouldn't be such a bad thing. Maybe losing my job would be just the kind of monumental event I sometimes fantasize about. Something that would really shake me out of the day-in, day-out of my average life, and allow me to find and pursue a real passion. Maybe it would change my life for the better. I wouldn't have my income. I would have lost my job. I would be shocked and heart-broken. Soon after returning from my walk, I got an instant message from my boss. "Can you call me? I'm in the conference room." That sickening feeling suddenly swelled up again. Breathing steadily, I dialed and spoke cautiously through the hellos and how are yous. Mercifully, she quickly got to the point. I'm safe. I still have my job. I'm still a working mom. My heart goes out to my colleagues who lost their jobs today. Instead of the 45-plus minute communte, I managed to squeeze in a run. On a little break this morning, I tidied up the kitchen, washed some dishes and put the breakfast stuff away. During lunch hour, I made some banana bread and pastry for the quiche for dinner. On an afternoon break, I changed the sheets on all the beds. Instead of fighting traffic on the way home from work, I just walked to the kitchen and made the quiche. With dinner already made, the stress of rushing home to make dinner was gone. So when picking up the girls from school, instead of gritting my teeth, taking numerous deep breaths and getting angry when they didn't listen, I heard about their days, listened to what they wanted to say and enjoyed their company. We ate dinner by 6:30 and had plenty of time to practice reading, read stories, play lego and tidy up the dinner dishes before beginning the bathtime-bedtime routine. Everything just seemed easier today. I hate it when it happens. Luckily, it hasn't happened for a while. But tonight, I lost it. My anger had been building up all day. But there was no good reason for it. By bedtime, I was tense. My nerves were frayed, and my non-listening, talking back, whining, make-a-big-deal-out-of-every-little-thing children were getting on every last one of them. Right before turning out the lights for bedtime, (If only I could have held out a few minutes longer...) the unfortunate target for my outburst was my oldest daughter. But of course, all girls were scared by my yelling. Quickly stepping back from my tirade, I snuggled with all the girls, and apologized for losing my temper. I tried to explain that it was okay for me to feel angry, but even if I was tired and grumpy, I shouldn't have yelled. That the way I behaved was wrong and not acceptable. That even though I was angry and that I yelled, I love them more than anything in the world. 2.5 y.o. Daughter - "When you're naughty, you have to go in cave with Spider-Man. Then you can come out". Big hug and kiss. 6 y.o. Daughter on hearing what youngest said - Laughed. "Just try to be nicer next time". Lots of big hugs and kisses. 4 y.o. Daughter - Fell asleep. Assuming that we all lose our tempers from time to time, how do you talk about it with your kids? Gratitude the feeling of appreciation within us. Being thankful is expressing that gratitude to someone. And thanksgiving is the celebration of everything that we have to be thankful for. I recently started a Gratitude Journal, hoping that by capturing little things from everyday I can become more appreciative of my busy and challenging but wonderful life. I'm grateful to my parents for their unconditional love and support, and for instilling in me the values of hard work and patience. I'm thankful for the wonderful childhood they gave me, which was filled with so many opportunities to learn and grow. I truly appreciate the responsibility and independence they taught me, and how they provided me with a model for how to raise my own family. 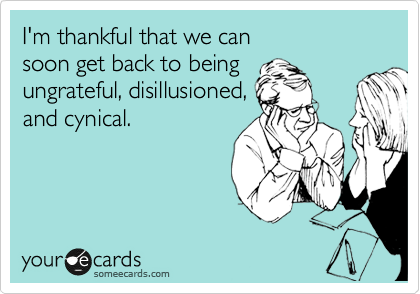 On a practical note, I'm also thankful for the fun family visits at the big house or cottage, how they get up early with the girls and let me sleep in, and the holidays for the girls when we need help with childcare. So many thanks are needed for my sister. I am grateful for all the times she drops by to visit, sometimes with croissants or other goodies, but always ready to jump in and offer us another set of hands. I am so appreciative of all the times she sticks around until bedtime to help with bathtime and stories, how she occupies the girls with creative crafts and activities, takes them out for walks or library trips or knitting lessons, giving us a break or a chance to get some job done. I love how she feels comfortable enough in our midst to intervene in sibling squabbles, tantrums, whining, and other episodes of poor behaviour. Not to mention all the babysitting she has provided for us, offering us the chance to get out some evenings to reconnect as husband and wife, instead of mommy and daddy for awhile. And the effort she makes to ensure I get out on my own with trips to the movies or shopping. She helps us out so often and so much, that it is hard to say thank you enough. For my in-laws, I have so many things to be thankful. Foremost are the weekly visits which include child care pick-up, dinner, clean-up, dog-walking, and bath- and bedtime assistance. Every week that they come, I am so grateful for the extra hands, and the extra free time in the evenings that I believe I am noticeably more relaxed, more likely to crack a bad joke, more likely to laugh and enjoy the craziness of dinner time. And yet, since it happens with such regularity, I fear that my appreciation is not communicated as clearly as it should be. But I am so grateful. I am also thankful for their generous financial support, family vacations and the general looking after us that they continually provide. They are always offering to help looking after the children when they're too sick for school or daycare or when gaps in childcare arise. And of course, I am also thankful to them for the great job they did in raising their son. To my husband, I am grateful for his love. He looks after my mind and my spirit, he makes me laugh, he inspires me to dream, and he encourages me to look after and love myself. (Although I'm sure he sometimes doubts this,) He keeps me sane. Plus, he bears an enormous responsibility in raising our family. Women may often feel that they alone do everything for their family. But although I may sometimes feel that our loads are not equally balanced when it comes to chores and responsibilities, I know that I could not do it alone. He does so much more to support me than can be calculated on a chore chart. He is a wonderful father, sharing many good values like self-confidence, healthy living and following ones' dreams. He is fair and stern, but fun and loving. He lights up our home, and my life. So, although my life can seem repetitive and challenging on a day-to-day basis, I am truly grateful for those people in my life who make it not just easier, but also more rewarding and more fun. I know I don't say it often enough, but thank you. Thank you every day. to the theme of my post, I couldn't resist. My first post to this blog was a description of my average day. Things have changed a bit since then: we no longer have a nanny, the girls to daycare, I've been attempting to gain some control of my days by waking myself up before the girls do, and the girls have become a little more independent while I've become a little less controlling. Alas, my Shampoo, Rinse, Repeat needed a revision. Alarm at 5:34 a.m. playing Christina Aguilera's Beautiful. Hope that the song will boost my confidence and bolster me for the day before I even open my eyes. Wonder if it might work subconsciously. Turn the alarm off before she finishes singing the first phrase, and will myself out of bed. Quietly suggest to the dog that it's time for a walk. Hope that his yawny stretches, body shaking and ear flapping don't wake the children. Curse the hinges for squeaking as we head out the door. Try to relax and enjoy the walk instead of feeling frustrated at his numerous stops to sniff and pee. Convince myself that this is a time for solitude and quiet reflection instead of another time-consuming chore. Hope that the children are still in bed when we sneak back into the house. Finish assembling breakfast necessities, packing snacks, water bottles, permission forms, lunch payments, swimwear, indoor shoes etc. into backpacks. Say good morning to the first little person to peek through the banisters on the stairs. Give good morning hugs and kisses. Finally drink some of the tea that I made in a travel mug when I first got up but forgot to take with me while walking the dog. Brush and style daughters' hair with varying levels of resistance while they eat breakfast. Silently hope that they don't ask for more toast. Assist the littlest one and supervise the others with getting dressed, brushing teeth, making beds and putting away clothes. Shower quickly with at least one interruption from a daughter asking about something that daddy has already answered. Get dressed and brush teeth while asking children to put the markers away, get their shoes and backpacks and jackets on and/or stop fighting with one another. Give 'have a good day' hugs and kisses to children and husband while helping to usher them out the door. Get in car. Hope for an easy drive. Listen to radio. Drive to office with a wandering mind. Arrive at work. Make more tea and breakfast for self. Work. If workload and timing of office arrival versus time of necessary departure from office permit, dash out at mid-day to quickly run errands or buy groceries. Leave office by 4:40 p.m. in an attempt to beat the worst of the traffic. Hope for an easy drive. Get home, park the car, walk over to the school to pick up the girls. Attempt conversation with my daughters about their days while wrangling them away from the playground. Coerce them to walk nicely together. Persuade the littlest that her feet don't hurt and that she isn't too tired to walk the short distance home. Attempt to discourage children from picking up any more rocks/sticks/leaves/berries. Inevitably, carry the littlest girl. Enter the house. Say 'yes, you may watch Wild Kratts' while trying to sound reluctant but actually ecstatic for the 30 minutes of (hopefully) relative peace during which I can put away backpacks and shoes, tidy up the kitchen from breakfast, prepare dinner, and possibly sweep the toast crumbs and pet hair off the floor. Feed dog. Intervene in one or more sibbling squabbles. Give praise and encouragement for the pictures coloured by at least one daughter who has lost interest in the Wild Kratts and come to the table instead. Eat dinner. Listen to stories from children, encourage children to eat their meals, ask children to sit properly, clean up spilled milk, and attempt mature conversation with husband. Bedtime routine. May or may not involve a bath, depending on day of the week, how dirty they are or what sticky things they have put in their hair. Assist children with getting dressed into pyjamas, brushing teeth, and putting away clothes. Read stories. Sing songs. Tidy up kitchen. Put away any toys, markers or craft materials left lying around. Move laundry from washer into dryer. Put a load of laundry in the wash. Walk the dog. Sign permission forms, reading lists and cheques for school programs. If time and energy permits, attend a yoga class, try to do a self-chosen activity, converse with my husband or watch television while folding laundry. Prepare snacks for school. Organise lunch for tomorrow. (Ideally, but often left for another day) Put away clothes. Climb into bed. Hope that none of my children pee in their bed tonight. Collapse into sleep.